There was an unemployed man looking for work. He found an opening at a zoo that was looking for someone to dress in a gorilla costume and sit in a cage. The real gorilla, the star attraction, had passed away and they didn't want to let the visitors know. He figured he could that. He applied, got the job, and began to sit in the cage in the gorilla costume. He got bored so he began to jump around and act "gorilla like". He found out that the more animated he became with the gorilla moves, the more elated the audience became. He was intoxicated with the accolades, so he thought he would really work the crowd. He began swinging on a vine, and on his third pass he slipped and flew right into the lion's cage. 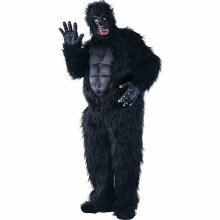 He realized he was in grave danger so he began to tell the audience that he really wasn't a gorilla, he was only dressing up in a costume and they needed to get help. Before he could get the message completely out, the lion pounced on the man, pinned him to the ground and said, "Would you shut up! Do you want to get us both found out?!" Most people spend the first half of their lives being what others expect them to be. They then spend the second half of their lives being what they were made for in the first place. But why wait til then to to become an authentic person? Becoming who you really are requires some bold moves. First you must get out of your costume. Undress yourself from market definitions of who you are supposed to be. Become unbranded from product lines and become your own brand. Do the hard work of discerning what expectations from others are accurate and which are unreasonable. I think your gut knows the difference. This will make you a new person. Then become free from your cage. If ignorance is bliss, then we have alot of contented people in the world. Don't believe everything you read or hear. Take the time to think and determine where you are being locked in by biases (yours and others), past disappointments and other restrictive components of life. Change and healing begins with you. Often our cages are locked from the inside. Finally, venture out into the wild. The philosopher David Henry Thoreau said that the "mass of men lead lives of quiet desperation." Often what is called resignation is in reality desperation. Out into the wild is really a part of the life you live now. To be out of your costumes and free from your cages opens a whole new adventure for the life you are already living. Doing this will give you a whole new purpose.